Geckos are a unique variety of lizard known for their more than 2,000 species that can be found worldwide. While geckos thrive in warm and tropical habitats and have for approximately fifty million years, these diverse lizards are also often kept as pets. In this article, we will cover a number of gecko species commonly kept as pets including the giant day gecko, the white lined gecko, the Central American banded gecko, the Madagascar Ocelot gecko and more. Why Keep a Pet Gecko? Before we begin to cover the numerous species of gecko that are kept worldwide we will first try to understand why lizard lovers choose to keep these lizards as pets. Geckos are particularly versatile pets and there are so many species that even the most advanced herpetologist can find a challenge in certain species of gecko. In general, the most commonly kept species of “pet” gecko are species which thrive in a glass aquarium and are species that are gentler in nature. These gentle lizards make for unique and beautiful pets that are not only fun to observe but fun to learn from as these tropical lizards are not native to most non-tropical climates. As important members of the ecosystem, it is important to be able to learn from the various gecko species in order to fully understand their function as well as their importance to the natural ecosystem. Geckos are not only fun and important in terms of providing educational opportunities, but these lizards are considered by many to be one of the most interesting varieties of lizard in the reptile community. With an incredibly diverse population of species that make them the largest of the lizard families, the gecko is one of the most unusual lizards for any herpetologist to learn from. As mentioned above the gecko is the single largest group of lizards in existence. In fact, there are over 2,000 gecko species currently recognized worldwide with many more expected to be discovered in the future. Of all of the species of gecko in existence, not all of these species are considered to be suitable for life in a glass aquarium. It is important for herpetologists of all skill levels to understand that while most species of gecko could be kept in captivity, not all of them should be because not all species will thrive. Of all gecko species however, there are a handful of species that are more commonly selected for life as a pet gecko due to a number of characteristics. 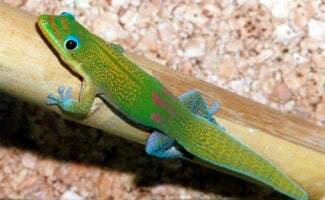 The giant day gecko is a diurnal species of gecko meaning that they are active during the day rather than at night. This particular species of gecko is native to Madagascar and is considered to be a particularly hardy variety of gecko. The bright coloration of this gecko (bright green and red) makes it a particularly pleasurable gecko to observe. The giant day gecko has been known to grow as long as 12 inches long when kept in captivity and can live for as long as 30 years! The long lifespan of this particular gecko species is just one of the most appealing factors that make it the perfect pet for herpetologists worldwide. While not all gecko species are capable of the glass climbing that many herpetologists like to observe in pets, the giant day gecko is something of an acrobat and can easily climb the sides of a glass terrarium. When kept as pets these geckos prefer to live in solitary or in mating pairs (they do not thrive when kept in communal terrariums). The giant day gecko prefers to live in a terrarium that is filled with plants and full spectrum lighting and it should be noted that these lizards prefer taller rather than wider tanks. It is important with most gecko species to ensure that the terrarium has higher levels of humidity in addition to having an adequate food supply and clean water source. The food supply that your gecko requires will vary depending upon the species of gecko you select. The giant day gecko prefers to feed on crickets, mealworms, wax worms, large fruit flies and fruit puree. The white lined gecko is a somewhat docile gecko in comparison to various other gecko species. 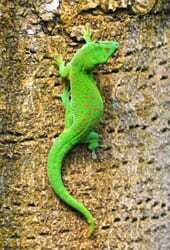 This thin but large green or brown gecko is so named after the white line that runs the length of its back and is native to the Indo-Australian Archipelago. This uniquely colored gecko is not only attractive to look at but it also possessed some of characteristics that herpetologists look for in pet lizards including the ability to climb, unique behavioral characteristics (curling of the tail when disturbed) and the ability to live in small communities. While most geckos prefer to live in solitary environments, the white lined gecko is capable of thriving in a communal tank if the tank is large enough. When keeping the white lined gecko, it is recommended that a tank is around twenty gallons in order to accommodate a pair of lizards or thirty five gallons or larger to accommodate three individuals of the species. This particular species of gecko can grow to approximately ten inches long which is why the size of the tank being used is an important consideration. Like most geckos, the white lined gecko requires a high level of humidity in its tank in addition to high temperatures. In comparison to some other species of gecko, the white lined gecko is relatively easy to care for in addition to being mild-mannered which is what makes this the perfect choice for newcomers to gecko keeping. The Central American banded gecko is a variety of gecko that actually spends the majority of its life on the forest floor rather than in trees. This gecko variety is also known for being a nocturnal species rather than a diurnal species and as such it should be expected to make the majority of its movements during the night. Due to the fact that this gecko species is nocturnal, it is not always the best choice for amateur herpetologists who want to see a lot of activity from their pet gecko. The Central American Banded gecko is native to Guatemala southward towards Costa Rica and can grow to around seven inches long. While the fact that this gecko species is nocturnal may be a turn off for some, this species is also very beautiful in terms of patterning and can make it irresistible to some herpetologists. The Central American Banded Gecko is one of the hardiest species of gecko to keep, but it should also be noted that they are not fond of being frequently handled particularly since the majority of handling occurs during the day when these reptiles prefer to rest. This gecko species is happy to live in a plastic shoebox type aquarium or a more traditional glass aquarium set up with a ten gallon aquarium being the perfect size for a breeding pair. While these reptiles are beautiful and hardy many herpetologists prefer not to keep them because they are not only nocturnal but they also do not exhibit the climbing skills of many other gecko species. For other herpetologists however, the fact that these geckos cannot climb is a drawing factor because it reduces the risk of escape from a glass terrarium. It is also important to note that for this nocturnal species of gecko it is particularly important to offer a selection of hiding places that can provide security. Not only do Central American banded geckos like to hide out during the day while they rest but these lizards also utilize seclusion when laying eggs and shedding skin. This particular gecko prefers to feed on young crickets a few times a week and wax worms occasionally. It is also important to ensure that the Central American banded gecko has a fresh daily water supply. This is from a Pets 101 segment courtesy of Animal Planet TV. If you’re not squeamish, geckos are a cool and exotic pet! The Madagascar ocelot gecko is much like the Central American banded gecko in that it prefers to live as part of a breeding pair or as a single male with two females in a larger aquarium. Unlike many other geckos because of its natural arid environment, this gecko prefers to live in a lower humidity aquarium with a higher temperature of between 82 to 88 degrees Fahrenheit. While this gecko does require lower humidity levels, it is still recommended that the sides of the terrarium be sprayed with water daily to provide adequate moisture. The Madagascar ocelot gecko prefers to feed on young crickets and mealworms and require a daily supply of clean water to drink from. Uniquely this species of gecko is a prolific breeder and is known to lie between twenty to thirty eggs per laying season. Because these geckos do lay so many eggs during a single season, it is critical to provide her with a healthy level of calcium supplementation or else all of her body’s supply of calcium will go into her eggs and she will become sick and potentially die from a lack of calcium. The frog eyed gecko is another nocturnal gecko known for burrowing. These terrestrial geckos are also commonly called “plate tailed” or “wonder geckos.” The more commonly recognized of the frog eyed gecko species is the Roborowski’s gecko. Roborowski’s gecko grows to a length of 4.5 to 5.5 inches long and features brownish orange bands across its body. The scales of this particular gecko are fishlike and are used by the gecko in an attempt to scare away predators when it feels that it is being threatened. The rattling of scales is not only used as a method of self-defense, but Roborowski’s gecko also uses this display as a mating courtship behavior and a method of establishing territory to other males of the species. Roborowski’s gecko in particular comes from China, Turpan to be exact – a location in northwestern China where the temperatures are extremely high in the summer and extremely low in the winter. The Roborowski’s gecko manages to survive in these extreme temperatures by burrowing into the sandy desert where it can maintain a healthy body temperature. When kept in a terrarium this gecko species requires a large layer of sand in the bottom of the aquarium in order to be able to burrow in to. Like many of the geckos previously mentioned Roborowski’s gecko generally thrives as a part of a pair and they prefer to live in terrariums of around 15 to 20 gallons so that there is enough room for both geckos’s to thrive. It is also important that these geckos have access to enough moisture so one end of the aquarium should be designated with moist sand so that the sand is easily moved to create a burrow in addition to water being put in to the aquarium for drinking. Maintaining the proper temperature of a Roborowski gecko’s terrarium can be tricky since they require high levels of heat in addition to temperature drops during the night and winter but this can be attained through the use of a heat lamp. The Roborowski’s gecko is most active in the early afternoon and prefers to feed then on a diet of young crickets and mealworms. The leopard gecko is a species of gecko that is commonly carried in pet stores and is native to South-Asian Afghanistan, Pakistan, Northwest India. This species of gecko averages around 6 to 10 inches long and prefers to live in rocky areas or grasslands as opposed to sandy areas like many of the other gecko species mentioned above. This particular species of gecko generally lives from 6 to 10 years; however, they have been known to live as long as 20 years. The leopard gecko is one of the most popularly kept reptiles second only to the green iguana. The leopard gecko can thrive in glass or plastic aquariums that offer a secure hiding place where the gecko can seclude itself. This particular type of gecko is nocturnal and as such they don’t bask like many other gecko species. Leopard geckos prefer to feed on young crickets and mealworms like most other geckos. 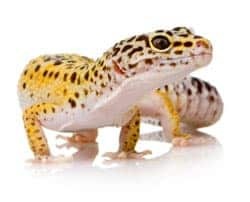 The optimal temperature for the leopard gecko terrarium is between 82 to 88 degrees, but they generally thrive much more when night time brings a drop in temperature. The appropriate size terrarium for the leopard gecko varies based on how many are being kept in one tank; however, it is important to know that these geckos prefer to be housed in breeding pairs or alone. A 10 to 20 gallon aquarium is recommended for housing one to two leopard geckos, but the larger choice is preferred to allow enough space for hiding places and other terrarium decoration. Some of the most favored terrarium decorations for the leopard gecko are live plants or artificial plants that provide a more natural setting. The gargoyle gecko is native to New Caledonia and is considered one of the easiest types of geckos to care for and as such they are recommended for beginning reptile keepers. Unlike many of the other geckos covered in this article, the gargoyle gecko is a tree-dwelling lizard and thrives in taller vivariums. These geckos grow to approximately 8 inches long including the tail and they can live anywhere from 15 to 20 years. The gargoyle gecko requires a tank at a minimum of 20 gallons, but the larger the tank,the happier the gecko will be. This species of gecko can live in small groups with a single male and multiple female geckos. Keeping multiple male gargoyle geckos in a single tank is not conducive to healthy living as the males will fight. This particular species of gecko prefers a tank that has a temperature between 78 to 82 degrees Fahrenheit during the day with a drop to the low 70’s at night. Since these geckos prefer cooler areas at times, it is important to be able to offer a section of unheated tank so that they can move to regulate their body temperature naturally. The gargoyle gecko feeds on many things including live insects, crested gecko food. If you have been considering bringing a lizard or reptile of any sort in to your home, one of the best places to begin is with the gecko. Not only are there many species of gecko to choose from when it comes to selecting the right gecko for you, but there is also a wide variety of experience levels available. While the beginner reptile keeper can find a gecko that is easy to care for and one that has a simple learning curve, the more advanced reptile keepers can also find a vast number of geckos that suit their needs as well! What better way to learn about one of the largest and most varied groups of animals in the world than with a gecko that is unique to your needs as a pet owner. Learn more about reptiles and other types of pets including hedgehogs and rats (yes rats). Do you think geckos are good pets? So I noticed that gargoyle geckos are here. I have one, and they are not as easy and simple as many people believe. They need constant requirements, unlike yet alike to a more popular gecko type, the crested gecko. Honestly, I would suggest a crested gecko rather then a gargoyle gecko unless you want to spend ovr 200 on the tank, and another 200 on the gecko itself. Don’t get my wrong, I love Reggie, my garg, but I do not suggest them as beginner pets. A few big problems here. Leopard Geckos originate from Afghanistan actually. It is also outdated and extremely dangerous to advise people to feed a gargoyle, crested or any Gecko for that matter any baby food. This can cause Metabolic Bone Disease which is deadly. Please remove such bad advice from the article. And you still haven’t corrected the Anole picture. Amateurs shouldn’t be advising on the care of animals that they have no experience in keeping themselves. We appreciate the feedback and will double check the facts and amend this article to ensure it’s accurate. Appreciate your expertise and tips regarding this particular species. In regards to the photo, we have updated that now as well. As you brought up, leopard geckos prefer to be housed in breeding pairs or alone. It’s important to know this information before you get one so you can properly prepare for them. It would help to start with one gecko to learn how to properly maintain it before moving on to getting more. Kendall, thanks for the tip! Great informative article, but the leopard gecko is a very hardy gecko with a lifespan of around 15 to 20 years. 6 to 10 years is an understatement for this species. Elisabeth, thanks for letting us know, we noted they can live up to 20 years. Lou, thanks for letting us know, we will update the photo so it more accurately reflects what the article is about. Thanks again for reading! YW ! Great article ! you is not correct on that because that is a gold dust day gecko and they are very pretty and I own seventeen of them. which is almost illegal where I am.